Vanguard's TBH-250 Ball Head With Micro Adjustment is a heavy duty ball head that features a micro adjustment fine tuning knob with the locking knob that gives you total control over ball friction for precise adjustments when composing your images. You can reposition your camera quickly, easily, and accurately. The TBH-250 is compact (4.72" (120mm)), weighs just 15.87 oz (450 g), has a durable magnesium housing, and features 2 bubble levels for precision attitude adjustment. It includes a 38mm universal quick release system, a built-in safety pin to prevent the risk of accidentally releasing your camera, and a single knob locking mechanism. It will support cameras, lenses and camcorders up to 44 lb (20 kg). The TBH-250 has an easy-to-grip lever that's oversized and can be repositioned easily for comfortable use. It provides totally secure locking, so your gear stays in place, no matter the angle. An oxidization anodized surface on the ball ensures it will remain scratch-free and provide ultra-smooth and precise movements. The TBH-250 is supplied with a QS-60 quick release plate. Box Dimensions (LxWxH) 6.0 x 4.9 x 4.0"
TBH-250 Ball Head With Micro Adjustment is rated 5.0 out of 5 by 1. Rated 5 out of 5 by Lee from I would buy this product again and I would also recommend it This is the first time that I have used a ball head on a tripod for my camera. The last head that I use for my tripod with a pistol grip and that like the other types that have this little stick that comes out that you turn on Titan or loosen so you can turn your camera and wrecked it I'll take your hands off of the camera. This ball had has nothing to grab other than knobs to loosen and tighten. This device forces you to keep your hands on your camera both of them so that you're focusing you're altering settings all that you need to do to get your next great shot. And all of this for a very very competitive low price and good quality. Does this head have the arca swiss standard? 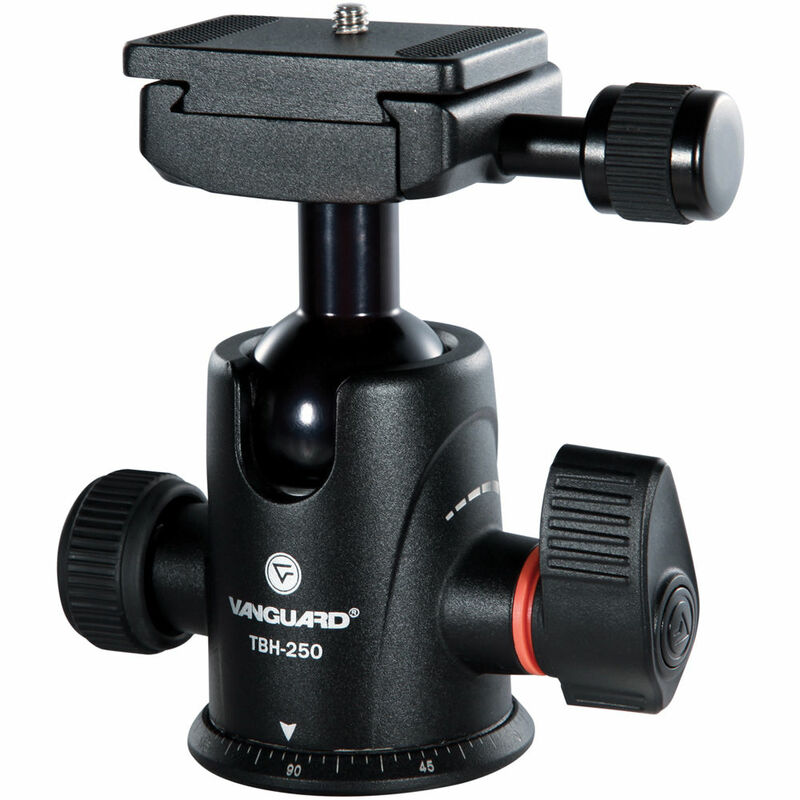 Yes, the Vanguard TBH-250 Ball Head With Micro Adjustment is compatible for use with Arca-Swiss quick release plates, and the Vanguard QS-60 Quick Release Plate included with the ballhead is Arca-compatible. Will this TBH-250 Ball Head compatible with the Alta Pro 263AT? Or what other ball head will fit the Alta Pro 263AT to make it an Arca Swiss compatible Tripod? What are the (main) differences between the TBH-250 and the SBH-250? One main difference is TBH-250 is arca swiss compatible while SBH-250 was not.